Im pretty sure that most of you have watched or at least heard of the movie The Mortal Instruments: The City of Bones which was based on the book of the same title written by Cassandra Clare. But what most of you might not know is that Cassandra has written another series, set as a prequel to The Mortal Instruments, called The Infernal Devices. The first book in the series, The Clockwork Angel, is the right book for anyone who loves adventure and fantasy with a faint hint of romance in the air. This book is set in the 18th Century and it all starts in the Dark House. 16 year old Tessa Gray, was held imprisoned by the Dark Sisters, Mrs Black and Mrs Dark,in England while looking for her brother, Nate, who had been missing for far too long. Tessa is the type of person who does not believe in magic, vampires, warlocks or anything such. My, she was wrong. Dead wrong. The Dark sisters, who are members of a secret society called The Pandemonium Club, tortured her until Tessa’s true form emerged. She is no longer that ordinary girl who came from a broken family that she thinks she is. She is a shape shifter that can transform into any identity she wants as long as she has something that once belonged to identity she takes on. Therefore, the Magister, also called Axel Mortmain will stop at nothing to claim Tessa’s power as his own. Will Herondale, the dashing blue eyed and jet black hair Shadowhunter, came to rescue Tessa just in time before the Dark Sisters prepared her for her courtship to The Magister and also managed to behead one of the sister’s head. Shadowhunters (or also known as Nephilim) are the ones who keep the balance between the human world and the Shadowhunter’smystical and chaotic world. Will and Tessa successfully escape the ugly demons (The Dark Sisters) and safely retreated to the Institute. Unfortunately, Tessa was knocked unconscious. The Institute is something like a hotel for Shadowhunters; it cannot be seen by human eyes, only theirs. The Shadowhunters engrave runes, which are something like really cool tattoos that have specific powers, onto their skin. Mundanes cannot see the Shadowhunters because of the runes. Tessa was sent to the Institute of London and was thoroughly examined by the Silent Brothers. The Silent Brothers are doctors in the Shadowhunter world. Through her journey of discovering the identity of the Magister and the location of her brother, she also slowly begins to understand who she is – growing stronger and more independent. That was just a brief explanation of the story, and hopefully it is enough to catch your attention. Personally, this is one of my favourite series. I’m not going to lie – I judge books by their cover. But I started reading this book as my friend had told me it was really good so I thought, ‘Why not give it a shot?’ The very first chapter drew me to continue reading. 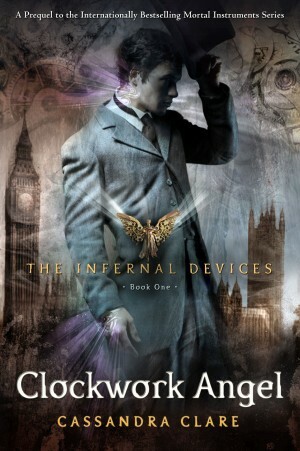 Though I did not really enjoy the Mortal Instruments series, the Infernal Devices trilogy is pretty good. I encourage teenagers to start on this series as this is definitely a trilogy that you wouldn’t want to miss.